Measure for Measure, Shakespeare’s rhetorically brilliant but generically ambiguous “comedy,” is perpetually a problem. Tyne Rafaeli, directing for co-producers, the California Shakespeare Theater (CalShakes) and Santa Cruz Shakespeare, provides a fascinating approach that does not “solve” the difficult text (and in some ways complicates it even further) but does provide a set of visual tableaus and cleverly staged moments that make it especially relevant to the Bay Area audiences and the fraught political moment in which we live. Why the play is so difficult is no particular mystery. Shakespeare adapted a completely tragic story (from the same source that he used for Othello) then – through the addition of a couple of hoary plot devices – restructured it into a comedy. Although everything does work out in the end, the tone of the play remains predominantly dark, however, so it is hard to know how lightly to take it and what to make of the moral dilemmas it poses. The convoluted plot is the story of a Duke who is reluctant to exercise his power to maintain order, and so temporarily turns his duties over to a puritanical deputy with no such qualms. To set an example, the replacement ruler immediately sentences a young man to death for the relatively minor crime of impregnating his fiancé before marriage. The young man’s sister (a novice on the verge of taking her vows to become a nun) makes an impassioned argument for his life, which perversely just excites the cold deputy’s lust. He propositions her, offering the brother’s life in return. Faced with what is known in literature as the monstrous bargain she refuses. “More than our brother,” she declares, “is our chastity” – a position that modern audiences, at least, do not always find sympathetic. 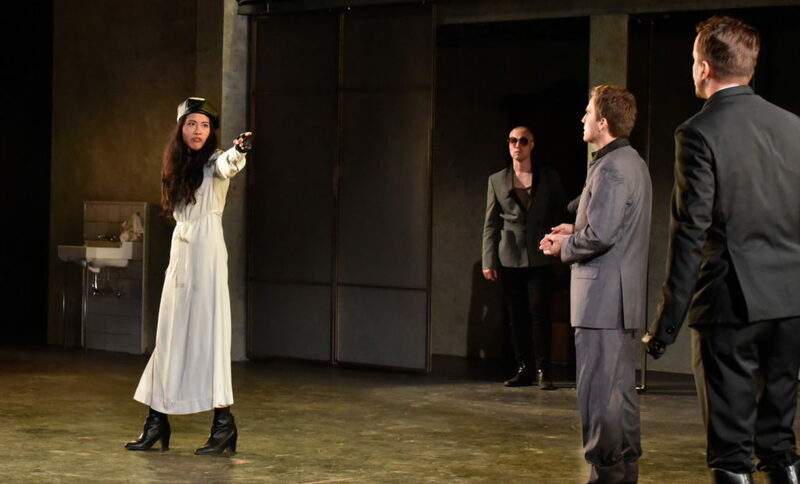 (L to R) Lindsay Rico (Isabella), Adam Schroeder (Lucio), Rowan Vickers (Duke) and David Graham Jones (Angelo) in California Shakespeare Theater’s MEASURE FOR MEASURE, directed by Tyne Rafaeli; photo by Jana Marcus. Oddly, the Duke is lurking about in disguise and convinces the heroine to pretend to assent, and then substitutes the deputy’s rejected fiancé in the darkened bedroom. In a not-all-that-shocking twist the deputy, even though he is fooled by the substitution, still orders the execution to go ahead. The Duke has to struggle around in the background to prevent tragedy, and eventually resumes his position in order to set things right – just not until after he has convinced the young man that will have to die, convinced his sister that he did die, and convinced the hypocritical underling that he got away with it all. (Although manipulative, it is probably supposed to have a Big Yellow Taxi effect.) By the time the ending comes, when the Duke proposes to the would-be nun, the audience has been bounced between the poles of starkest tragedy and melodramatic relief several times. Rafaeli imbues her production with an artificial urgency throughout, which makes it all look and feel much more like a farce. This certainly reduces the tonal whiplash we usually experience in productions of this title – but also rushes the detailed explanations of what is happening (and why) to the point that it is often far from clear to anyone not already familiar with the play what is transpiring. Lindsay Rico (Isabella) in California Shakespeare Theater’s MEASURE FOR MEASURE, directed by Tyne Rafaeli; photo by rr jones. Her brother, whose punishment vastly outweighs his crime, is played by an actor of color. Rafaeli’s staging of his scenes of imprisonment with starkly contemporary details to the cell is surely meant to remind us of the injustices of our current system that disproportionately imprisons black and Latino men. A stumbling block for many Measure for Measure audiences is often that they find the overly-harsh sentence silly instead of serious, but in Rafaeli’s context it is all too plausible – again speaking to both the local audience and current moment. Throughout the play, Rafaeli uses the broad, shallow setting to create quick visual snapshots of important moments that remind us of nothing so much as eye-popping comic book panels freezing the action into bold compositions. Although wide and flat, Annie Smart’s set is both functional and effective for this purpose. It is very unlike the usual stage sets in CalShakes’ outdoor location where seeing into the far distance is possible. Montana Levi Blanco’s modern dress costumes often border on the whimsical. It is Kent Dorsey’s lighting that ultimately makes Rafaeli’s visual summaries burn into our consciousness. Adam Schroeder and Annie Worden in Montana Levi Blanco’s fantastical costumes. To achieve the contemporary resonance, both verse speaking and self-conscious rhetoric were sacrificed to more physical approaches. As a result, the small players were often the most interesting members of the cast, especially Annie Worden’s rapid-fire turns as the Mistress Overdone, the Dogberry-like constable Elbow, the belligerent drunk, Barnadine, who farcically refuses to be executed, and Mariana, the heartbreakingly rejected fiancé of the false deputy who finally reclaims him from his own hypocrisy. CalShakes favorites Tristan Cunningham and Patty Gallagher also produce compelling and varied performances across a number of roles, as does newcomer Kevin Matthew Reyes as the brother, Claudio, and his polar opposite, the amusing pimp Pompey. 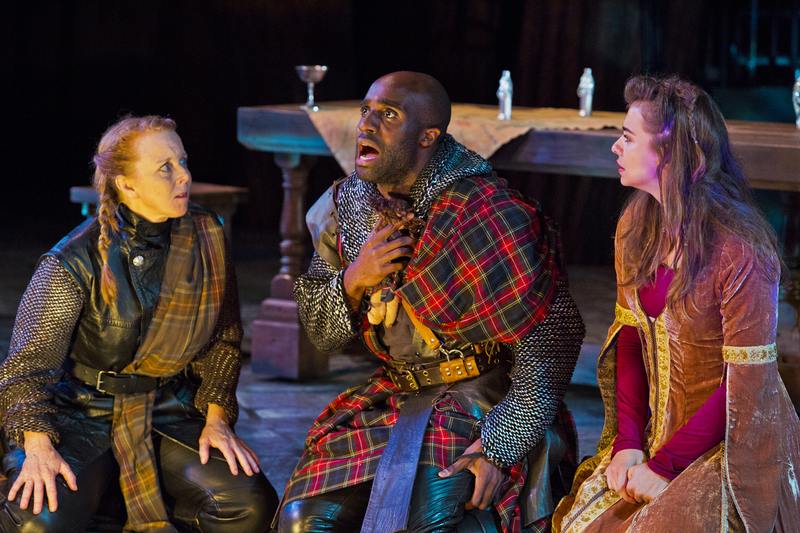 (L to R) Tristan Cunningham (Escalus) and Annie Worden (Elbow) question Patty Gallagher (Froth), and Kevin Matthew Reyes (Pompey) in California Shakespeare Theater’s MEASURE FOR MEASURE, directed by Tyne Rafaeli; photo by rr jones. In the end, this production was a reminder that there is no such thing as a definitive staging of any Shakespeare play. There are endlessly fascinating possibilities, however. Measure for Measure is often a showcase for exceptional voices and fine verse speaking. It is almost unique to see it staged as a director’s vehicle emphasizing visual pictures and physical comedy. It is hard for me to remember any production of this show that was so closely tuned to place and time in which it was presented. At Santa Cruz Shakespeare Kate Eastwood Norris is not only a woman playing Hamlet, she is playing Hamlet as a woman – and the result is every bit as wonderful (in an especially Santa Cruz-ish way) as you might expect. 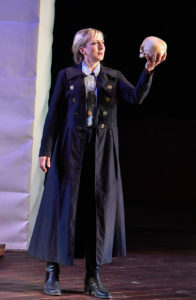 Kate Eastwood Norris (Hamlet) in Santa Cruz Shakespeare’s 2016 production of Hamlet 2016. Photo by Jana Marcus. Although a woman playing the role of Hamlet is not nearly as rare in theatre history as most would suppose, or even unique to the San Francisco Bay Area this season (given Shotgun Players’ conceptually fascinating Hamlet roulette which randomly selects a women for the role in about half of its performances) Ms. Norris in the title role at Santa Cruz Shakespeare is notable for a number of reasons. First, she is genuinely good in the part. Second, she debuted in the part the same night that Hillary Clinton became the first woman nominee of a major party for President of the United States and the historic resonance with the audience was palpable. Most of all, however, what makes this casting particularly interesting is that it is situated within a production that genderbends a number of roles in ways that illuminate the play anew. This is the second season in which Artistic Director Mike Ryan has pursued a policy of gender equity in casting. This is no mean feat, since Shakespeare’s plays do not feature anything like equal balance of male and female characters. Most companies that are trying to address this concern (not nearly enough) do so by pursuing what is known as “gender-blind” casting, wherein women are cast in male gendered parts but the convention is that the underlying gender of the actor is irrelevant and essentially ignored. Others do so by “conceptual casting,” in which women simultaneously “play” and “comment on” their characters. In this case, the female interpretation of the male role becomes the major interest. This tends to be especially true of all-female productions. Ryan has consistently taken a different tack. At SCS, the roles have been regendered to match that of the actors playing them. In this production, not just Hamlet, but also Polonius, Rosencrantz, Guildenstern and Francisco all become female characters. (Unsurprisingly, from the point of parity, no gender bending moved characters from female to male, but – at least in the case of Ophelia – this still had interesting consequences.) Although it is the sort of change that makes purists blanch because it alters the play in some fundamental ways, it also provides new perspectives on often overly familiar literature that can (when well done) make it a totally new experience. This has become the house style at SCS concerning gender, although the company (or at least its predecessor company, Shakespeare Santa Cruz) has long practiced color-blind casting, as it does in this production. Kate Eastwood Norris (Hamlet) and Larry Paulson (Player King) and the other Players in Paul Mullins’ beautiful staging. Photo by Jana Marcus. For ardent Shakespeareans, the “insider baseball” for any production of Hamlet is which Hamlet we see. The text exists in three vastly different Renaissance versions. Two of them get most of the attention. The so called “Second Quarto” of 1604, and the First Folio of 1623 differ in length by some 150 full lines. Q2 contains an entire soliloquy that is cut from the Folio, and there are hundreds of minor wording changes. This production cut a good deal of the text, with some interesting minor rearrangements here and there, but generally followed the Folio version. It is the third alternative that can provide, continuing our baseball metaphor, the real curveball. The “First Quarto” of 1603 is a bizarre text, half the length of the others and featuring what almost sounds like a paraphrase of the text to which we are accustomed. Most scholars believe that it is a version of the text put together from memory by actors, observers (or both) without consulting a written manuscript. However odd it is, and Q1 is really odd, it has a few interesting features which might relate to it being pieced together after watching an actual performance. Most significantly, the scenes are in a different order. The most famous soliloquy in the canon, “To be or not to be,” sits at the start of Act II instead of the beginning of Act III. Santa Cruz performs the piece in Q1 order, although it utilizes the wording from the F1 text. This makes a world of difference. Hamlet becomes far less indecisive and confused. In the typical order, Hamlet confirms his uncle’s treachery through a performance of a play-within-the-play that replicates the conditions of his murder of Hamlet’s father. He seems overjoyed at this, but in the very next scene he returns with his famous contemplation of suicide. Modern actors go through all kinds of psychological twists to make sense of this bizarre emotional reversal. In Q1 order, however, (as performed at Santa Cruz) Hamlet is suicidal when she is not sure whether her father is a truthful ghost or a deceiving demon, but snaps back out of this depression once the playlet reveals the truth and never wavers thereafter. This is not only sensible, but thrilling. Eastwood Norris’ Hamlet is far stronger than that of most men I have seen play the role, flirting with madness to a far smaller degree, which is largely because of her own laser-like focus, but the less confusing order of events also propels her forward in a manner that is more palpably immediate and less intellectually abstract. 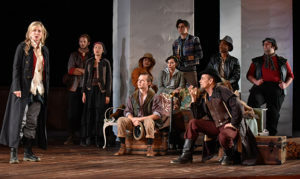 Mike Ryan (Horatio), Kyle Hester (Marcellus), Kate Eastwood Norris (Hamlet), Cody Nickell (Laertes), and Christian Strange (Barnardo) in Santa Cruz Shakespeare’s 2016 production of Hamlet 2016. Photo by Jana Marcus. The production features a number of very notable performances. Bernard K. Addison plays both the ghostly King Hamlet and the villainous King Claudius. Cody Nickell has the unenviable task of finding a way to keep the complexity in Laertes’ character, although an awful lot of social conditioning teaches us that someone who would plot the death of a woman (as Hamlet is in this case) is not just duplicitous but also a bully. Even viewed through that lens, however, he finds the redeeming humanity in the character. Mike Ryan is a solid and precise Horatio. Patty Gallagher (a performer whose work I consistently admire) brings a pathetic depth to Polonius that I have rarely seen. She seems less a silly old fool than a woman who is hopelessly double-bound by the responsibilities she is given and the disempowering standards of behavior to which she is held (restricted?) while trying to achieve them. Although Eastwood Norris’ Hamlet provided a very interesting resonance in the shadow of Hillary Clinton’s achievement, Gallagher’s Polonius was equally reminiscent in another way as we saw and judged her quite differently than we would a man in the same situation. Mary Cavett as Rosencrantz and Katherine Ko as Guildenstern are guileless schoolgirls, clearly out of their depth. In this one case, I worried about the difference casting women in the roles made. It was not their performances, which were impeccable, but the context. When I learned (spoiler alert) that Hamlet had substituted an order than ended with their execution, Hamlet’s declaration that “they come not near my conscious” proved the least sympathetic moment of the evening – a touch of calculated cruelty that made me cringe, and made me think about why it felt so different from how this moment usually plays. Ryan’s leadership of SCS is brave, and in this case, Director Mullins delivered on his mandate and made a female Hamlet feel both inevitable and historic at once. *Although we have not seen each other since, full disclosure is that Mullins was a classmate of mine in the Professional Theatre Training Program at Southern Methodist University in the early ’80s. 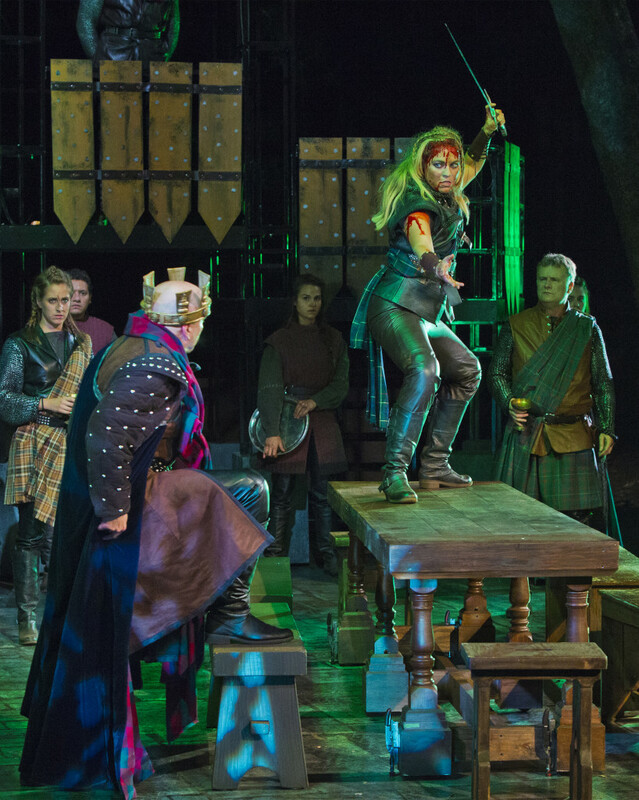 In Kristen Brandt’s production of Macbeth, Scotland’s aristocratic class of Thanes is composed equally of hulking men straight out of Braveheart and badass, broadsword-wielding warrior women. 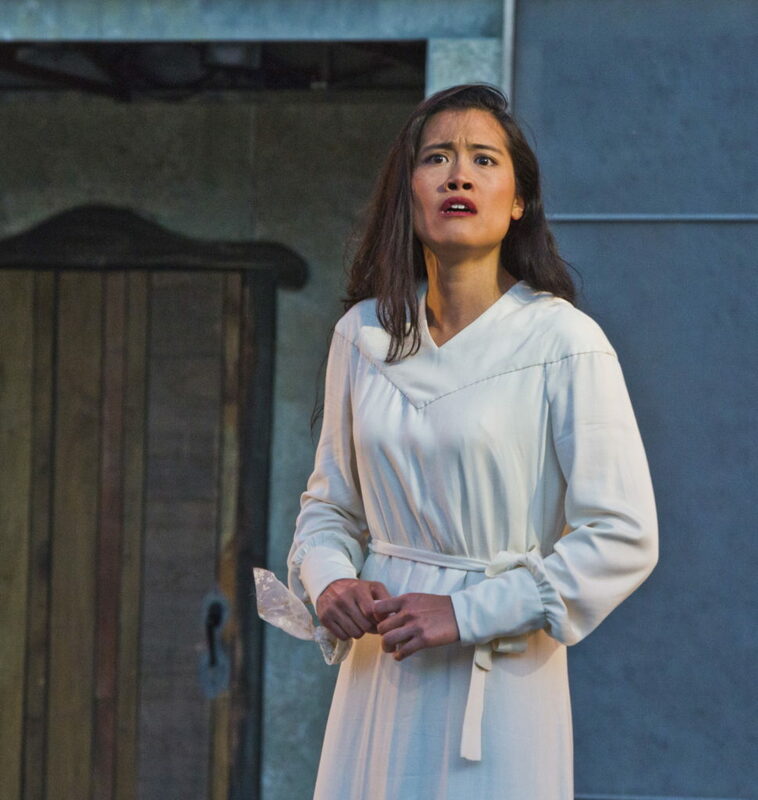 This is far from the only way that actresses are especially prominent in Santa Cruz Shakespeare’s current offering, but it is the most viscerally startling. Particularly, the magnificent Greta Wohlrabe’s Banquo (absolutely gendered female without having to become Banqua…) is unforgettable from her first bloody appearance. Steve Pickering (Macbeth) and Greta Wohlrabe (Banquo) in Santa Cruz Shakespeare’s Macbeth by William Shakespeare. Also pictured (l. to r.): Madison Kisst, Carlos Angel-Barajas, Kipp Moorman, and Sarah Traisman. Photo by rr jones. Malcolm, Princess of Cumberland, played by Sierra Jolene; and the Thane of Ross, played by Patty Gallagher, offer more variations on the theme—as do several ensemble players—but even in their less fierce portraits we are closer to Mad Max or an episode of Vikings than the typical Scottish setting. The extensive re-gendering of characters (aided by extensive pronoun changes and other textual adjustments) may be more a product of the company’s gender parity policy than the director’s vision, but the immediate effect is a fresh look at the play. Lady Macbeth is tough, but given the world of this production, she does not seem particularly villainous—as an unending stream of misogynistic versions would have her—as much as a product of her times. Her statement that she would kill her own child before backing down on her word (as she accuses Macbeth of considering) seems not monstrous, but simply a matter-of-fact. In director Brandt’s hands, she is also not easily erased. When her death is announced, it is by a character carrying her corpse in a spectacular coup-de-théâtre. The body is immediately handed to Macbeth, and he holds it painfully and awkwardly until he goes forth to fight his final battle. 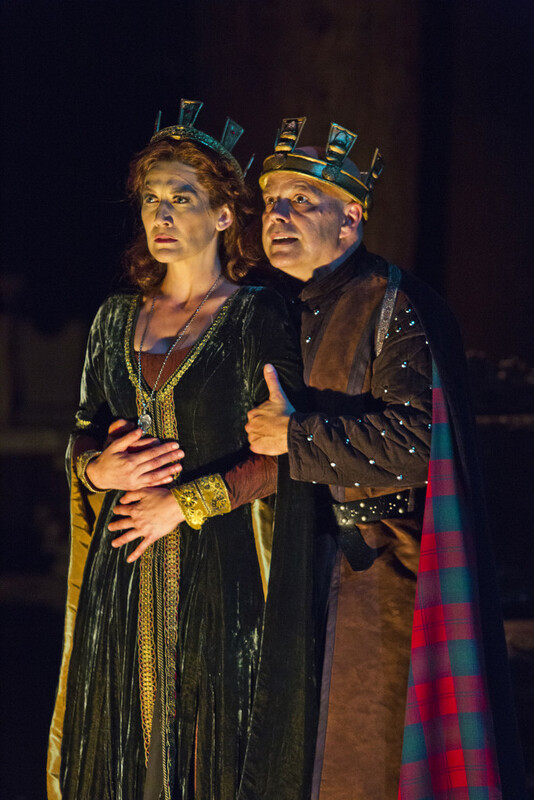 Melinda Parrett (Lady Macbeth) and Steve Pickering (Macbeth). Photo by rr jones. Oddly, in this world, it is Lady Macduff who seems out of place when she is unwilling or unable to defend herself. Her helplessness does not diminish the tragedy of her murder but it does seem surprising given the number of expert swordswomen we have seen, and have come to accept as unremarkable, throughout the evening. In this particular environment, gender roles are not associated with extremes of masculinity and femininity. Both Steve Pickering as Macbeth, and Toby Onwumere as Macduff, take advantage of this to play more wildly emotional characters than we are used to seeing in these parts. It is a fearless cast, but I would not have predicted that this would manifest in leading men as the ability to play their fears and pain so openly. This was the great revelation of the evening. I did not realize how much, in most Macbeths, the Thane’s masculinity is expressed by emotional detachment and dehumanization until I saw this portrayal which was so vitally alive. Pickering was deeply emotional throughout, especially in soliloquy, and if anything led to his defeat it was that Onwumere (as Macduff) was even more so. Patty Gallagher (Ross), Toby Onwumere (Macduff), and Sierra Jolene (Malcolm). Photo by rr jones. Not everything about the reworking was successful—Malcolm’s equivocating test of Macduff was as interminable as ever, for example—but seeing so much in an altered context kept the production intriguing even when the pace slowed in the second half. Brandt’s interest was largely in the psychology of character, with the supernatural element substantially less prominent than the Rupert Goold film starring Patrick Stewart or other recent versions. When it came time to kill Banquo, she did select Seyton (Darek Riley) to play the mysterious third murderer, but the insistent pronunciation “SEE-ton,” rather than the punning “Say-tan,” told us that in her vision characters control their own fates rather than being manipulated by evil. In this production, Fleance escaped his assassination because the murderers were inept, not because he was protected. Brandt is an exciting director. Her production of Merry Wives of Windsor in the same venue a year ago was a revelation because—surprise!—it focused on the wives and not Falstaff. It is not fair to suggest that her production of Macbeth likewise shifts focus to the women. What it does do is re-contextualize both the women and the men so that we can see the story without quite so much sexist baggage. That is a great gift. “Emotion and comedy are enemies,” wrote the great French philosopher Henri Bergson, in a famous essay on humor. Santa Cruz Shakespeare’s beautiful, but strangely heartless, production of The Liar (adapted by David Ives from French neo-classic author Pierre Corneille, who in turn had adapted it from Spanish Golden Age writer Juan Ruiz de Alarcón y Mendoza) is a study in how difficult finding balance can be. There are some terrifically funny scenes in this very pleasant comedy, but the overall effect was oddly cynical about both love and honesty. Since its premiere in 2010 at the Shakespeare Theatre in Washington, D.C., which commissioned this loose translation/adaptation, Ives’ version has become a staple of the Shakespeare Festival circuit. (In the Bay Area, Marin Shakespeare performed it in 2012, in a well-reviewed production I did not see. 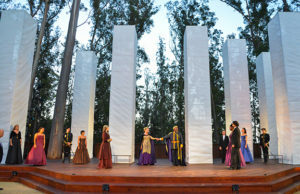 The following year Livermore Shakespeare Festival performed a version that, as I said in my review, I found charming.) Ives plays with language amusingly in a witty, anachronistic iambic pentameter version that tells the story of a young rake-on-the-make, Dorante, who is perpetually incapable of telling the truth and his hired servant, Cliton, who is equally unable to tell a lie. Ives is, of course, a well-known playwright of absurdist-flavored comedies of his own devising, especially Venus in Fur – and his screwball rhymes, silly puns, and sly insertion of contemporary observational comedy explain exactly why the Shakespeare Theatre chose him to create this new version of The Liar. Toby Onwumere (Cliton), Brian Smolin (Dorante), and Mary Cavett (Clarice) in David Mickelson’s costumes. All photos by Shmuel Thaler. Much of the action is farcically mechanical, and when that is the case (like the comings and goings of “a set” of identical twin serving maids with opposite temperaments, played to great effect by Melinda Parrett), Art Manke’s direction is meticulous. Fight choreographer Kit Wilder created a terrific mock duel involving imaginary rapiers that extended that precision from the ridiculous to the hilariously sublime. The play is more than a farce, however. Our lying hero, Dorante, is using his talent for prevarication to pursue a young woman who has caught his eye, and in the manner of romantic comedy that leads to an eventual love match. In this case, however, too much comedy becomes the enemy of emotion. It is hard to root for Dorante, or at least Brian Smolin’s chipper but strangely charmless rendition of him because, while his flippant self-absorption got the verbal antics right, it created little empathy. The young woman – or as soon becomes apparent, women – who so entrance him were played by Sierra Jolene and Mary Cavett with wit and verbal dexterity, but as so calculating that it is hard to identify with them, either. As I observed about Santa Cruz’ other offering in the current repertoire, exploring the callowness of youth does not an evening make. In their outstanding production of Much Ado About Nothing, an engagingly emotional supporting cast provides depth that the youthful leads cannot. There is much less opportunity for such humanity in Ives’ play, but even Kurt Meeker, as Dorante’s long suffering and endlessly forgiving father, stays in key with the rest of the production by playing the part with an emotional distance at odds with the sentiment implicit in the script. The cumulative effect is chilly. When the clever resolution is finally reached, although amusing on a surface level, it is hard to care, and not even clear that it is a good thing. This peculiar outcome is partially the result of the artificiality of the elevated playing style, partly because of the mask-like quality of the exaggerated make-up, but mostly because the emotional depths of the narrative are left unplumbed. The essential ingredients are all there, but as in a soufflé, it requires delicate handling to makes it rise. The good news is that there is plenty of time left in this run for this gorgeous production to find its emotional balance. Mike Ryan is making a lot of smart, invigorating decisions as Artistic Director at Santa Cruz Shakespeare, but the smartest of all might be to feature his own talents as Benedick in their current production of Much Ado About Nothing. He is an exceptional actor, generally under-utilized in dazzling cameos and featured side-kick roles. He is evenly matched by the wonderful Greta Wohlrabe, who was outstanding last season in the secondary roles of Mistress Page in MWW and Celia in AYLI, and is even better now when she is promoted to the central role as Beatrice. Character actors are placed front and center – and celebrated – throughout this production, with the famously quarreling couple masterfully mining the text for both humor and emotional nuance. Mike Ryan (Benedick) and Greta Wohlrabe (Beatrice) in Santa Cruz Shakespeare’s Much Ado About Nothing. Photo by rr jones. Under the direction of Laura Gordon, the production is set just as the troops return from WWII, with strong Rosie the Riveter-type women tending what appears to be an idyllic California vineyard. (More about those women later!) Nina Ball’s minimalist set and B. Modern’s costumes gave the show a postwar flavor that was never really foregrounded (at least not in the way that a similarly situated Taming of the Shrew at Livermore Shakespeare Festival utilized this tension a couple of seasons ago) but made perfect sense as a background. The gorgeous lighting is by my SFSU colleague Ray Oppenheimer, and Kurt Landisman. 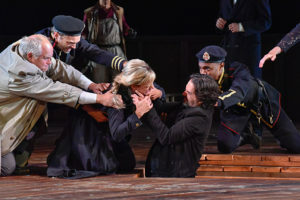 The challenge of Much Ado is that the protagonists – a young Count Claudio and his intended bride, Hero – are not particularly large or compelling parts. Josh Saleh and Sarah Traisman are more than competent in these roles, but exploring the callowness of youth does not an evening make. The energy of the show must come from the supporting characters, particularly from Beatrice and Benedick who have to run the gamut from farce to border-line tragedy. A silly set of clowns also invigorates the proceedings (and provides the actual solution to the plot crisis, albeit accidentally). Nina Ball’s minimal but useful set in the gorgeous Shinsheimer-Stanley Glen. Ryan and Wohlrabe find the complete range of tones in their characters. Both are pleasantly humorous in their farcical scenes but really come into their own when revealing the darker content. They handle the language beautifully, making the text accessible without compromise, but what ultimately makes this a moving and inspiring evening is that they are willing to explore their own emotional vulnerabilities in ways you rarely see in comedy. Steve Pickering accomplishes a similar virtuosity, although he does it by playing a pair of contracting characters rather than revealing the range of a single one. His sinister Don John, the antagonist of the play, is coldly chilling but by the addition of a pair of glasses and a thick, hick dialect he becomes the hilarious constable Dogberry. Madison Kisst (George Seacoal) and Steve Pickering (Dogberry). Photo by rr jones. Another source of interest in the evening stems from Ryan’s decision as AD that the organization should try to achieve gender parity in its casting. Because the casts of Shakespeare plays are far from evenly balanced with male and female roles, that involves some careful decisions about how to deal with the mismatch between supply and demand. It is possible for women to simply put on pants and play the male parts (a decision employed by SF Shakes last summer) but Director Laura Gordon settled on prominently regendering the roles of Hero’s father and uncle – Leonato and Antonio become Leonata and Antonia. This is not just a matter of switching pronouns, however. In a play with a plot that so thoroughly incorporates traditional gender roles and male privilege, the resulting shift in perspective could unsettle the balance. Particularly at the moment of crisis, when Hero’s parent turns on her after Claudio rejects her at the altar as unchaste, only an artist of fierce intelligence and exacting specificity could make that plausible as a mother’s psychological shock rather than a father’s loss of property and “honor.” Fortunately, Patty Gallagher is such an artist. Although known locally for her almost ditzy comic turns, she is both smart and brave, and in this production she totally “goes there.” Backed up with equal strength by Suzanne Sturn as her sister, the about-faces of the characters became not just more plausible, but actually more compelling when they finally do the right thing and confront the callow count and his misogynistic enabler, Prince Pedro. It is worth seeing this production just to watch these two women reinterpret these roles. You are currently browsing entries tagged with Santa Cruz Shakespeare at Shakespeare's Tribe.